Practically camera bellows is made by three layers, there are inner layer, ribs, and outer layer. Two layers sandwich ribs, so each fold of bellows is formed. To ensure ribs will guide us how to fold the bellows when sandwiched layers cover up them, cracks between ribs are necessary, and thus reduce the thickness at the tip of folds. 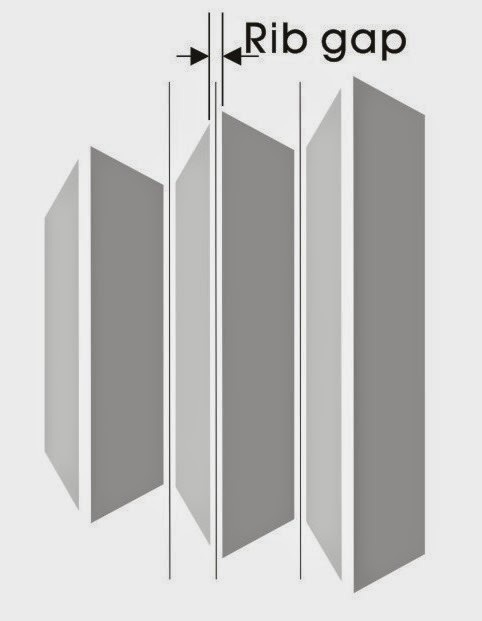 And to simplify the building procedure, we will cut off the ribs at corner, as above image shows. This is a popular way of building bellows, especially for mass production. I myself prefer to extend the ribs to the corner, for that provides maximum shape forming and light blocking function. I found this in the market and tried it on ribs, you know what, it is PERFECT! The thickness, the stiffness, and it absorbs glue so well, I love it, you should try this!! It is made of plastic material or mixture with stone powder, so sometimes I heard them call it stone paper. It is tear-resistant and often you receive name cards that is thin but can not be torn into pieces, that’s it! It is not easy to buy in sheets, I found no for retail, you have to order in a minimum quantity from factory, and you won’t want to know that figure! So if you can have some sheets in hand, congratulations! If not, self adhesive pp printing paper can do the same job. Well if you are lazy as I am, don’t want to spray glue on ribs by yourself, you shoul consider this, after laying out the template, take off the wax layer of the paper with tip of kraft knife, then it is ready to paste! If you don’t make so many bellows, you can pick this as sheets, any store sells printing paper for inkjet printers has it as 10-sheet pack, best to get matt surface, for you will apply glue for it. This is most common use for ribs, for it is thin, a little bit stiff, and durable, and very easy to get. I use it not only as ribs, I use it for plotting templates also. Here in Taiwan Kraft paper sold as “majhong paper” in rolls, with 20 or more sheets of size about dining table, people lay it on top of table while playing majhong. 4 sides of bellows need ribs, and they are all in the same rib width interval, so if your tools and material allows you, why not make them in one shot? Let's assume that each side of bellows has 18 pairs of rib, including exceeding ones for frame gluing. If you trim each rib pairs one by one, there are 36 trimming for one side, then 4 sides would take you hundred more trims, spare your eyes and waist, they are innocent! By simple layout, you can solve all the trimming in one job, if your tools and material allows you. However, due to my tools limitation, I would have rib pairs for two sides in one trim. 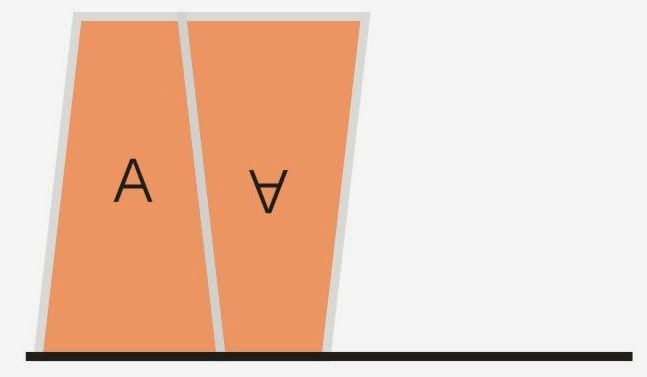 Shape A and B have different slant sides, build them separately could reduce confusion in work. 1. 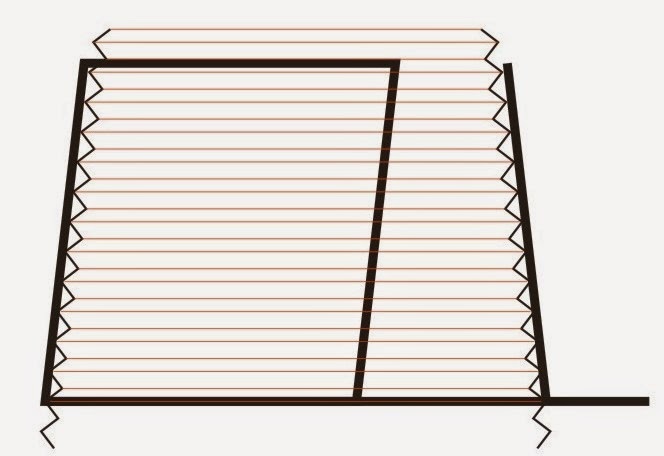 Draw a line on Kraft paper, at least the length about 2 times bottom+ top side of shape A. 2. 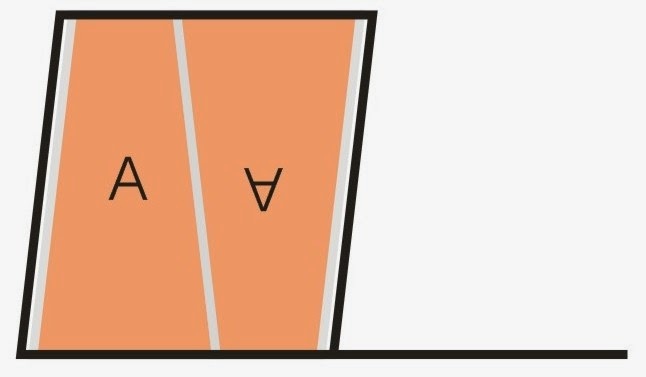 Align with shape A template at end of line, draw two slant lines, connect both ends, this parallelogram is the area for 2 shape A. And with shape A template, draw a slant line at extended line. 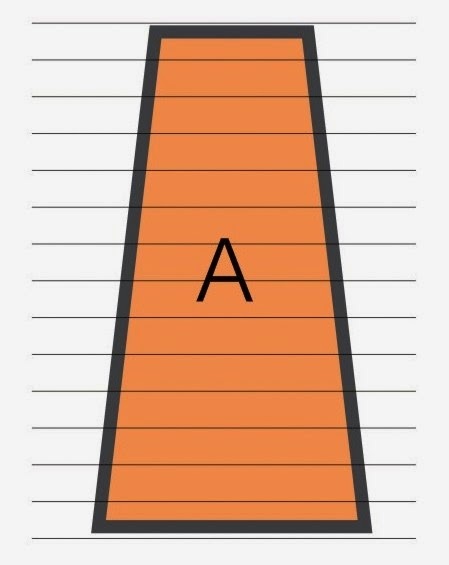 Notice you align the right side of template. 3. Now with zigzag ruler, draw zigzag lines at the left most and right most slant lines. 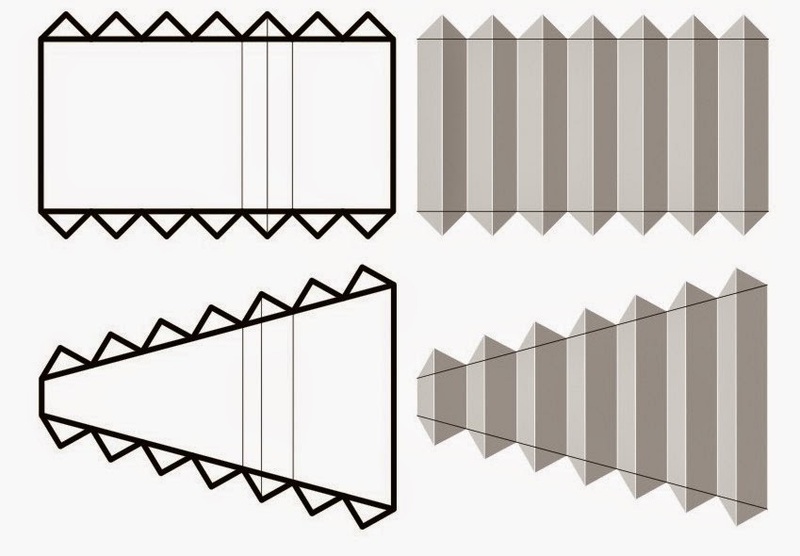 Connect each zigzag tip to correspondent tip, now you have all the guides of rib pairs. 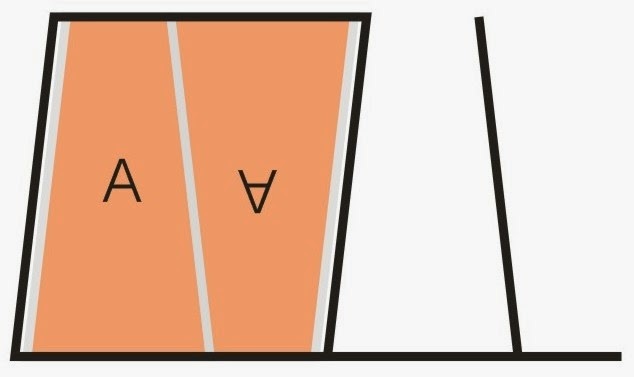 Measure rib pair carefully, you will find that ribs are in two widths, it is the nature of taper bellows, only square bellows has unique one width of ribs. And if you inspect the image more carefully, then you can tell that wider ribs are always the longer one in rib pairs. I got about 6.0 mm and 8.0 mm for rib width, but I will leave space for rib gap. Rib gap width varies as the size of of bellows, small bellows for 120 folders, 5x4 cameras, are set at about 0.8~1.5 mm. It should be at least double the thickness of bellows made by outer layer, rib, and inner layer. I assume my bellows will be made in the thickness at about 0.4 mm or less, so I will set the gap at about 1.0 mm. So what rib stripes I need to trim will be in 5.0 mm and 7.0 mm. 1. To trim paper stripes in 7.0 mm and 5.0 mm width, better there is an aid to to the job. Cut a piece of template plastic, made it in this shape. In fact, I made both side of guide for different rib width, dents should be larger than the paper you prepare for ribs stripes. 2. Trim rib stripes with the help of stripes guide. Here I pick tempura paper for ribs, I like the quality of the paper, it is made in very good fiber, a little bit stiff in touch, and it surely will be great at absorbing glue, it is made for absorbing. In my bellows, I need to trim about 40 strips both for 7 mm and 5 mm version. Here I paste both ends of stripe guide to the steel ruler with tapes, this will make cutting even easier, you can see the results in video below. Now back to shape B layout, do the same job and get the rib guide on kraft paper, and cut the ribs that shape B needs. Shape B has different widths of ribs from shape A, but they are so little in difference, so I decided to ignore them, and prepare 7 mm and 5 mm stripes for shape B too.